COURAGE OF THE SPIRIT: Book is now available for purchase! Book is now available for purchase! Book is now available both print and eBook at Amazon,Google Play, Kobo, Nook and Apple ! Many books have been written of the spiritual heroism of the Jewish people as they rebuilt their lives after the devastation wrought by Hitler’s attempt to wipe out every last Jew, but some books stand out as unique because they are written by family members who were told those stories of heroism firsthand. Courage of the Spirit (paperback ISBN 978-0-9846685-6-4; ebook ISBN 978-0-9887048-9-3) is such a book. 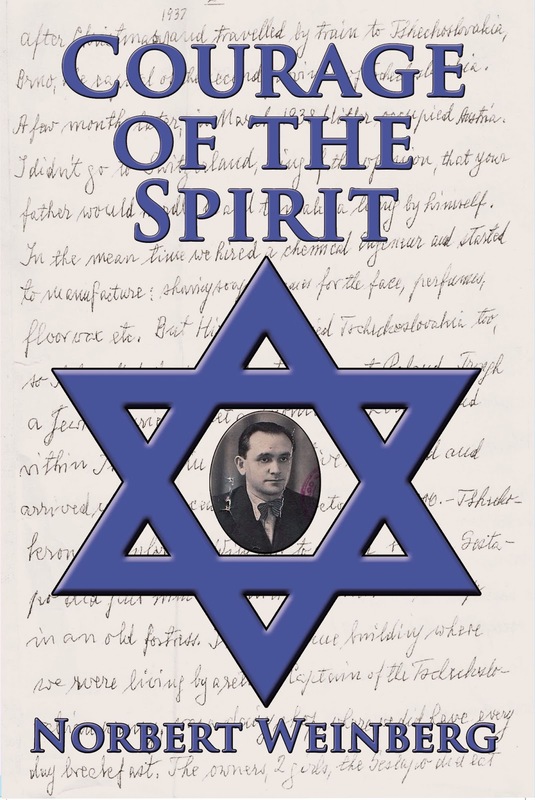 It portrays the spiritual struggle of one man during the first half of the twentieth century—the author’s father, Rabbi Dr. William Weinberg, who survived under Nazi and Communist tyranny to become the first State Rabbi of the community of Holocaust survivors in the German State of Hesse. Rabbi Weinberg’s saga serves as a tour of the ideologies and principles of the contemporary world, but it also encompasses the movements that shape Judaism today: Orthodox, Reform, and Conservative, as well as political Zionism. It is a story that spans thousands of physical miles, by freight train and on foot, from the Galician Shtetl to cosmopolitan Vienna and Berlin, and to Stalingrad and central Asia and back as Rabbi Weinberg kept one step ahead of the Nazi armies. It is a story that spans the mental and emotional journey from the medieval Shtetl, the great empires, and the weak democracies and totalitarian regimes that followed, and finally, to freedom. Along the way, we meet significant figures in Rabbi Weinberg’s life: Martin Buber and Mannes Sperber, the founders of Israel’s Marxist-Socialist party, Rabbi Leo Baeck, and Albert Einstein. We are shown a window into life in a Nazi prison and concentration camp, the day-to-day life of Jews in Nazi Berlin, and the vagaries of survival under Stalin’s totalitarian shelter. “This book reconstructs these events from conversations with my father, from family notes, and from historical documentation,” says the author, Rabbi Norbert Weinberg. Courage of the Spirit is the first part of a trilogy. The second part will follow the account of Irene Gottdenker, the author’s mother, who openly survived the Holocaust in the guise of a Pole of German descent and witnessed the destruction of the Jews in Lwow and Warsaw. The third part will examine the rebirth of Jewish life in the refugee camps in Austria and then in the city of Frankfurt, Germany, and the environs. IndieGo Publishing is an independent publishing firm that believes in supporting authors as the world’s primary source in promoting freedom of expression through the written word. Retailers may order Courage of the Spirit through Lightning Source/Ingram.